As a little girl, I can remember waiting for what seemed like forever at the local fair while my Dad and brother threw wooden balls at a row of coconuts in the attempt to win this exotic prize. Once the hairy husk was prized open and crumbly white flesh exposed, I’d try a tiny nub but soon be distracted by the other edible excitements on offer: burgers from the BBQ, bags of sweets or a stick of candy floss that melted with every messy, fuzzy mouthful. On holiday in Italy, alongside the peddlers of sarongs and sunglasses, friendship bracelets, beads and other seaside tat, I was always intrigued by the man who sold coconut. Muscley, suntanned and glistening with sweat, he’d carry an enormous basket of coconut in one arm and a bucket of iced water in the other, his cry of ‘Cocco, bello cocco’ audible from miles across the sand. It looked and sounded so exotic, but when push came to shove, the lure of an Italian ice cream or granita would always win out. Butter, on the other hand, is an ingredient that I absolutely love. Salty or unadulterated, spread thick on homemade bread, creamed into cakes, crumbled into pastry or melted into nutty beurre noisette, butter brings flavour and texture, all-round richness and deliciousness to almost any dish. Despite this love, I’ve finally decided to experiment with coconut oil. Buzz around this ‘superfood’ seems to have been building for the last five years and now seems to have reached an all time high with nutritionists and bloggers around the world praising its use in everything from frying fish to baking cakes. Although high in saturated fats, coconut oil burns off quicker than butter, helping boost metabolism and is said to help towards a healthy heart and a myriad of other benefits. The recipe below is an experiment with coconut oil and my contribution to Easter baking for this year. I love hot cross buns (previous recipes here – Verison 1 and here – Version 2) but find a full batch can be a bit too much for the two of us to get through before they go stale. I know that they freeze well, but once the idea of a hot cross loaf had lodged in my mind, thickly sliced and toasted on demand, I knew it had to be made. I’ve adapted Paul Hollywood’s hot cross bun recipe using a list of ingredients that I hope you will fall in love with as much as I have. My loaf is 100% wholemeal, the dough enriched with coconut oil, maple syrup, almond milk and spice, kept moist with a juicy grated apple. I appreciate that the inclusion of eggs may be annoying for anyone looking to create a completely vegan loaf, so although I haven’t actually tried it, I would think you could replace the beaten egg with a small amount of mashed banana to reasonable effect. If you try it, let me know. If you’re a butter-loving sort of a baker, this loaf is the perfect introduction to coconut oil. If you’re already on board, it’s a great way to use any oil you’ve got going spare. In amongst the excesses of Easter, the slices of Simnel cake, towers of chocolate eggs and rich roast lamb, this lovely loaf is equally delicious but a little bit more virtuous. Which means you can smear on that little bit more butter, of course. Put the flour in a large mixing bowl. Add the salt and maple syrup to one side and the yeast to the other. Add the coconut oil, eggs and milk and mix together with your fingers. Add the water, bringing together to make a soft – but not soggy – dough. Use the mixture to clean the sides of the bowl then tip onto a lightly floured surface and knead for ten minutes or so, until the dough starts to form a soft, smooth skin. This dough is fairly sticky so if you have a stand mixer with a dough hook, now would be a good time to use it. Lightly oil a bowl, pop the dough inside, cover with a tea towel and leave to rise until doubled in size. This could take as little as an hour, but two or three is fine. In a small bowl, mix together the dried fruit, orange zest, orange juice, grated apple and spices. Once your dough is ready, tip onto a lightly floured surface, push into a large flat rectangle and scatter over the fruit mixture. Knead in until evenly incorporated then return to your bowl, cover and leave to rise for a further hour. Preheat your oven to 220 degrees C and lightly oil two 1lb loaf tins. Tip the dough onto the work surface and press out into a large rectangle. Divide the dough into two equal sized pieces. Taking one piece, roll one third of the dough into the middle and press down. Repeat the other side and press down until you have a firm sausage shape then tuck the ends under and place in your baking tin. Put the two tins inside a clean plastic bag and leave to prove for one hour. The dough should rise up above the edges of the tin and double in size. Mix the flour and water to a thick paste. Fill a piping bag fitted with a small nozzle. Take your loaves out from inside the plastic bag and pipe a large cross over the top of each one. Bake for 30 minutes or until golden and the bottom sounds hollow when tapped. Remove from the oven and place on a wire cooling rack. Warm the apricot jam with a splash of water and brush over the tops of the loaves to glaze. Served in thick slices, this moist loaf is delicious as both bread and toast. Hot Cross Loaf is an absolutely genius idea! I love it. 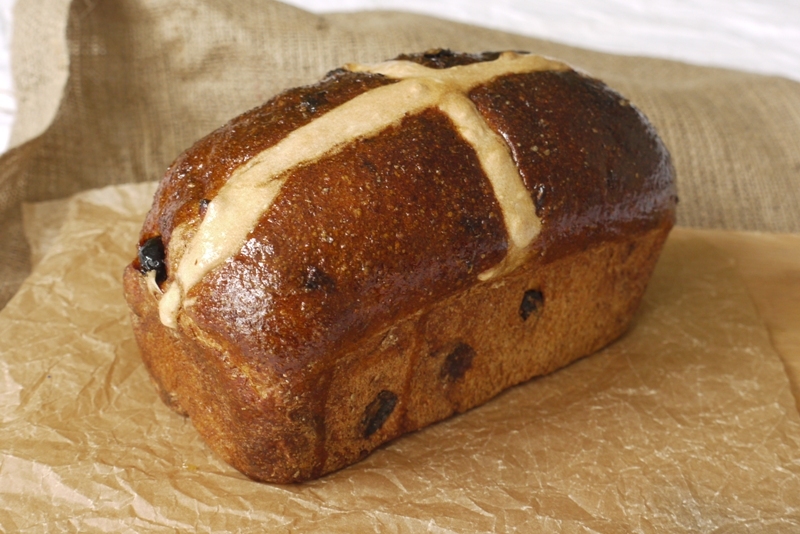 I’m going to make my first batch of Hot Cross Buns this year… so will save a loaf for next year. Beautiful. I have a jar of coconut oil in my cupboard but have not gotten round to using it yet. This sounds great. 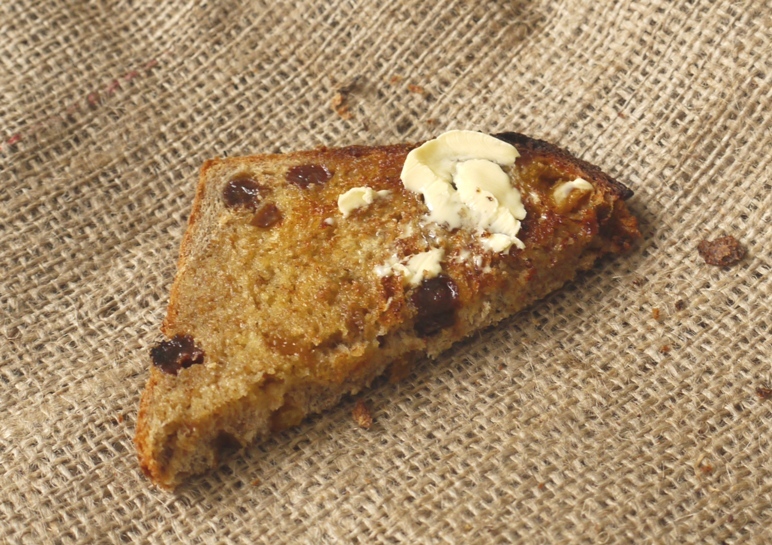 Can you taste a hint of coconut in the bread? You can’t taste the coconut at all which is what I wanted really. If you fancy something more coconutty you could replace the almond milk with coconut milk? Let me know how you get on! This looks wonderful. I used coconut oil lots after holidaying in Kerala years ago – they use it in lovely, healthy veggie and fish curries. I love it as a body moisturiser too. This loaf looks absolutely perfect! I’ve been experimenting with coconut oil too, some experiments more successful than others. This though, as you say, looks like a perfect introduction to coconut oil. What a beautiful loaf, and a great idea. The texture of the loaf looks perfect! 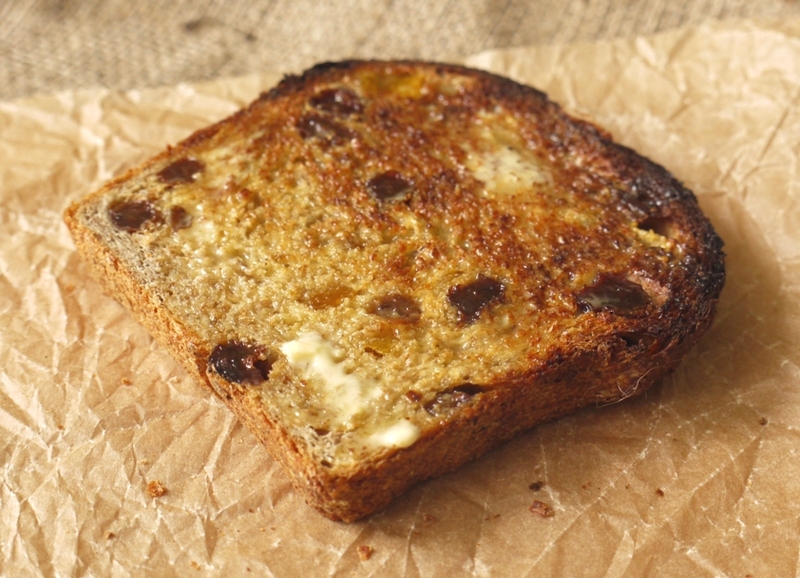 Small contribution from my frozen pen in the Tuscany hills – try a toasted slice of this magnificent loaf with slatherings of butter and a modest swipe of Marmite: the sweet & sour effect is magical. Oh Nino, I promise to bring you a slice of something tasty next time I’m in Tuscany! I usually like a loaf version rather than buns, so this is my ideal hot cross recipe. Coconut oil is not available here yet, I´m sure it will be in the near future, so of course I want it. But with canola oil this should be a wonderful bread too! The kind I like to make for myself. That looks lovey. The sort of bread I want for breakfast. The last time I tried to make a spicy fruit loaf, several years ago, was a bit of a disaster. I couldn’t get the dough to rise. In desperation I took the bowl to bed hoping my body heat would give a bit of a helping hand. Nope. Gave my partner a laugh anyway. 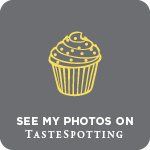 Lindsay – had to comment as you made me laugh! Brilliant! Shame it didn’t work! What a stunningly perfect loaf! And I love the coconut oil, maple syrup, almond milk and the spices! I do have a jar of coconut oil and this is the loaf for me! It looks so delicious! Bravo! I’m not a hot cross bun fan but I am almost tempted to bake your recipe as I just love the idea of a hot cross loaf. So clever! Plus I have used coconut oil on my skin but never in my baking yet…. 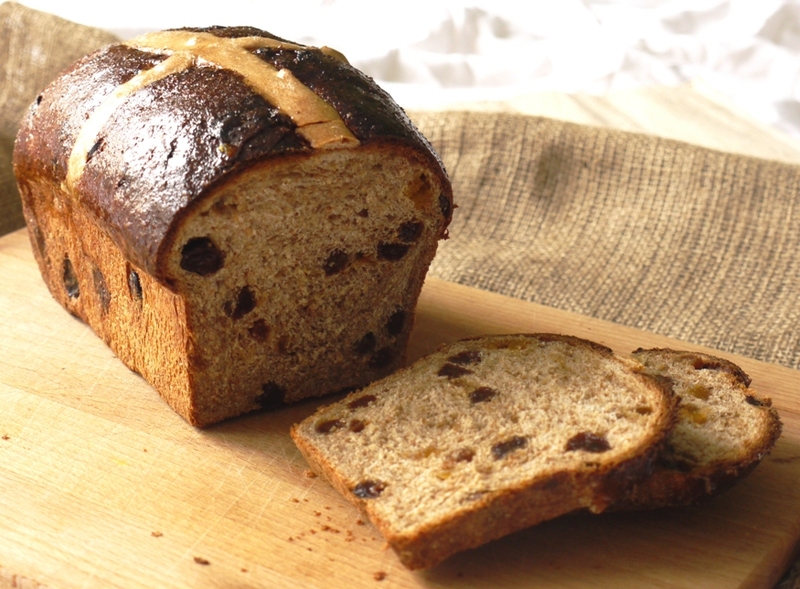 It depends what you don’t like about hot cross buns… I’m not a fan of mixed peel so I’ve used raisins and apricots – the mix ins are pretty adaptable as are the type of fat and sweetener! Did you really have to post a picture with melted butter, to yum for words and I don’t have lunch for another 3 hours lol Great recipe, will definitely give this one a try for Good Friday. Thanks for sharing. I’m afraid that is too cool, sorry. Oh, this is VERY interesting. The husband has got a bit obsessed with almond milk at the moment (he loves it poured over an espresso), but would love to see how it works in baking like this. Thank you! I’ve not done enough experimenting to be sure, but almond milk seems to create a lovely texture in baked goods. Hope you hubby likes it! It’s great – you can bake with it, fry in it and even use it on your skin as a moisturiser! I bought some coconut oil a few months ago but I still haven’t baked with it. This looks like the perfect place to start! Thanks for sharing such a great recipe. Oh I so feel you on coconut – I still can’t stand Bounty bars but I’m learning to appreciate it more and more. Love that you used coconut oil here! What a fun idea for a loaf. It looks amazing! I love coconut so I definitely want to try this at some point. Love this healthy take on hot cross buns! It looks great, and I’m really excited to learn that coconut oil can be used effectively in bread baking. First off…that loaf is gorgeous – magazine worthy! 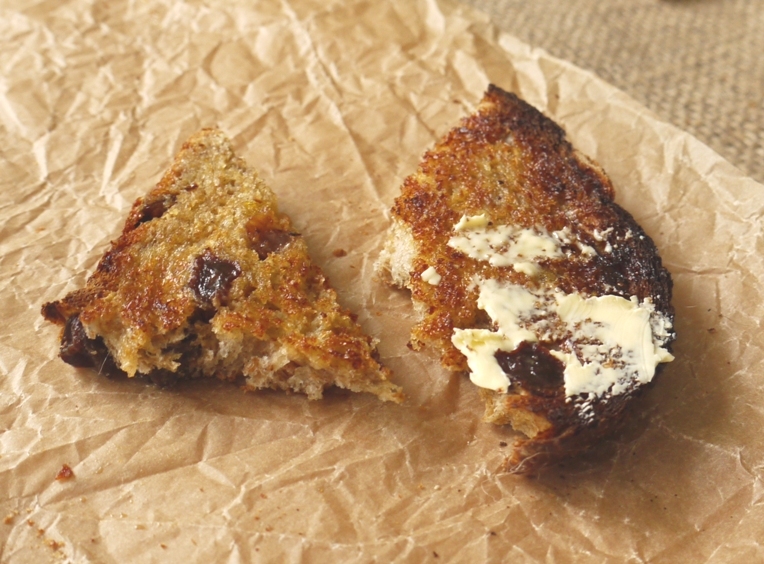 What a brilliant idea to turn a pan of hot cross buns into a loaf and a healthier one at that! The coconut oil and wholemeal bread flour sounds wonderful! Happy Easter to you and yours! Thank you Lisa and happy Easter to you too! Oh just perfect cake! I love the idea! Oh two of my favorite baking an d cooking ingredients are butter and coconut oil, they make everything taste better! oh this looks so good, I’ve only baked Hot Cross Buns for the first time this year for a magazine feature I was working on, I had so many buns I froze them and I now make Hot Cross Bun and butter pudding with them. This loaf would make a fine Hot Cross Bun and butter pudding I’m sure! I love hot cross buns but a loaf sounds so much more exciting! Definitely trying this out this week!! I love the cross look on the top! Perfection!! Yes, absolutely. You could use olive oil or the same amount of melted butter. Made this today. Took a bit less water than the recipe and even then quite sticky to knead, but oh, so worth persevering with! Really tasty, lovely texture. I love it buttered and hubby likes it toasted and buttered. Either way, a real winner! Don’t hold back on the spices. Do you think you could do the first stage of this one evening and leave it to rise over night? Thinking i can start it Thursday night, then finish with a second rise early Friday ready for breakfast on friday morning!